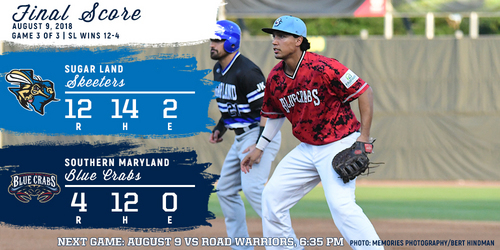 (Waldorf, MD., Aug. 9, 2018) - The Southern Maryland Blue Crabs (9-18) lost the series finale against the Sugar Land Skeeters (20-9) 12-4. Both teams got on the board in the second inning, two for the Skeeters and one for Southern Maryland. After a groundout started the top of the inning, David Wayne Russo (1-4) issued a walk to Matt Chavez to allow the first baserunner of the game to reach for Sugar Land. Back-to-back singles followed to load the bases, with a walk and then a sacrifice fly bringing home two runs. Southern Maryland responded on an RBI single from Cory Vaughn in the bottom half of the inning that brought home Jon Griffin to make it a 2-1 game. Sugar Land’s offense came alive once again in the third inning, as they put up four runs in the inning. Barrett Barnes started the frame with a solo homerun, his third long ball of the series. A walk and a hit-by-pitch followed, setting up a three-run homerun from Juan Silverio to extend the lead to 6-1. The Blue Crabs offense would look to counter in the bottom half of the inning. After a double play put two away, Devon Rodriguez doubled to extend the inning to Griffin. The clean-up hitter would come through with an RBI single to plate Rodriguez. An error and a single would load the bases, but Dallas Beeler would get a strikeout to escape the inning and limit the damage to just one. After two straight scoreless innings, the Skeeters offense would explode for six more in the sixth inning. A pair of singles started the inning, a sacrifice fly from Barnes would bring home Alvaro Rondon for the first run in the inning. Anthony Giansanti would follow that with a single to score Javier Betancourt, before a passed ball moved Giansanti to second. A flyball put the second out on the board, but Sugar Land would spark a two-out rally. Silverio started that rally with a single, scoring Giansanti from second. Back-to-back singles followed with Albert Cordero bringing home Silverio. Denis Phipps and Rondon would add a single each, both scoring a run before the inning would finally come to an end with the score at 12-2. Frank Martinez would launch a solo homerun in the bottom of the sixth inning to get across a third run for the Blue Crabs. A scoreless seventh would follow, before Southern Maryland would add another to their tally in the eighth. Griffin and Frank Martinez would start the inning with a pair of singles, with Griffin moving up to third on a flyout to right field. Vaughn would add another flyball, this time to left field and deep enough to bring Griffin home from third. A walk and a wild pitch put two more in scoring position, but a flyout would end the frame and strand both men at second and third. After Blue Crabs relievers retired nine straight batters over the final three innings, the offense was left trying to make-up eight runs in the bottom of the ninth. Teodoro Martinez singled to start the inning, but a double play and a strikeout would finish things off, as Sugar Land took the game 12-4 and finished off the sweep. The Blue Crabs return to action Friday, August 10th for the series opener against the Road Warriors. First pitch is scheduled for 6:35 P.M. on Friday at Regency Furniture Stadium.